So much for that "smart diplomacy"
"Ecuador will not accept pressures or threats from anyone, and it does not traffic in its values or allow them to be subjugated to mercantile interests," government spokesman Fernando Alvarado said at a news conference. The funding would be destined to help "avoid violations of privacy, torture and other actions that are denigrating to humanity," Alvarado said. He said the amount was the equivalent of what Ecuador gained each year from the trade benefits.Didn't America get some respect in the world back in the old days? Belo Horizonte ~ I found a gas station that sells unbelievable premium beer here in Belo Horizonte. In a country where light lager rules, the micros, Belgians and and local micro brew movement is taking a stand. It just happens to be at a Petrobras gas station, and I don’t mind. The gas station even sells the finest Anderson Valley, Sam Adams and Rogue offerings as well as one of my favorite breweries in the world, Brew Dog out of Scotland whose mission is to replicate California’s IPA movement in the UK. Fantastic beer. Sign post in the Horto neighborhood of Belo Horizonte. Riot: Brazil scored 2, Uruguay scored 1, Protesters scored 0. When Brazil wins an international soccer match ain't nothing going to stop the party or make people care about political issues afterwards. Thank goodness they won though. Had they lost things might have gotten nuts. UPDATE: the destruction and violence I didn't witness was extraordinary yesterday here in Belo Horizonte. It's surreal how I can mingle in a section of the city that is in pure euphoria because of a soccer win while a nearby section of the city is in complete turmoil and violence. Belo Horizonte ~ Former Brazilian bank robber, and current socialist Brazilian President, Dilma Rousseff has, in response to the protests SWEEPING the nation of Brazil, called for numerous changes that actually violate the constitution of Brazil. This seems so familiar to this American. But the difference from the response in the United States is the opposition parties (yeah plural, crazy that) have expressed extreme outrage bordering on traitorous declarations. This is very refreshing after witnessing the Republican party not really express anything other than the sound of their swallowing while on their knees. Dilma backed down from her requests. It's nice to see a real opposition party instead of the Democratic Republican representatives we have in Boehner, Graham and McCain. Although from what I've understood from the current administration, no one avoids using teeth better than they. Belo Horizonte ~ If you have an HSBC USA account that you regularly use in Brazil, be advised that last month HSBC Brazil lowered the daily limit one could withdraw from an account from 1000 reals ($500) to 200 reals ($100). HSBC USA still has a daily limit of $500 but HSBC Brazil explained to me today that FOR MY PROTECTION the limit was reduced to 200 reals and it was not possible to get more than that. In further banking comedy HSBC defines a day as a business day which on the weekend is from Friday at 8AM until Monday at 4PM. One is only allowed to withdraw a total of 200 reals during that period. An entire weekend for 4 people on $100. Grab the Let's Go Brazil book! Imagine you're talking to somebody from 1988 and you tell him that in 25 years, a US intelligence agent will reveal state secrets, be labeled a traitor and a spy, and flee to Russia. And a majority of young Americans will be rooting for him. From the communication I'm getting from the states the image the news must be presenting is total chaos in Brazil. The protests are definitely real and dangerous but in typical Brazilian fashion it only impacts a small area of each city while the rest of the areas act as if nothing is happening. Reporting from Niteroi, Rio de Janerio, Brazil: I had a lovely evening 2 nights ago when hundreds of thousands of Brazilians rose up to protest a .10/.20 increase in bus fares, or so I was originally told. I found out later that the Brazilian masses are actually protesting the absurd corruption that is being exhibited in Brasilia and the latest scandal which caught a bunch of congress folk breaking many laws only for the congress to introduce legislation that made those illegal acts legal. It's funny how when the people's candidate is elected, Dilma, the administration becomes more corrupt than the previous. Kind of like the good ol'US of A. Except here when the new administration exhibits behavior that is criminal the people rise up, close bridges and ferry terminals and express their general dissatisfaction with the situation. Whatever happened to the Schumer-Boehner Reich Flight Tax? Remember the Schumer-Boehner proposal to seize the assets of Americans fleeing the regime? Whatever happened to that? Rich Americans are still renouncing their citizenship. Ben Bernanke would have done well to study Hyman Minsky's financial instability hypothesis before he set about trying to centrally plan the markets. The second theorem of the financial instability hypothesis is that over periods of prolonged prosperity, the economy transits from financial relations that make for a stable system to financial relations that make for an unstable system. What do you expect from a crack addict when you threaten to take away the crack? Best analysis of that scene here. Two years ago, we brought you one of West Virginia's most famous sons, the bath-salt-abusing transvestite goat molester. At about 1:30 a.m. on May 1, 2011, the fraternity was having a house party both Louis Helmburg III and Hughes were attending, according to a complaint filed Jan. 23, 2012, in Cabell Circuit Court. When doing so, Hughes startled Helmburg, who then jumped back and fell off of the deck of the fraternity house and was injured, according to the suit. He was lodged between the deck and an air conditioning unit. The Chinese called. They want their gold. With citizens in the developing world gaining wealth and sure to want their share of gold at some point, do you really want to be underweight gold the next 10, 20, 30 years? It looks like that point is now. Stunning images from China: Ten thousand people waiting in line to buy gold. WaPo: Baby boomers are killing themselves at an alarming rate. [...] an alarming trend among baby boomers, whose suicide rates shot up precipitously between 1999 and 2010. Are Scandis the most ironic people on earth? To be fair, Krugman got his Nobel before he abandoned economics to become a political hatchet man, and for a topic that had nothing to do with deficit spending. 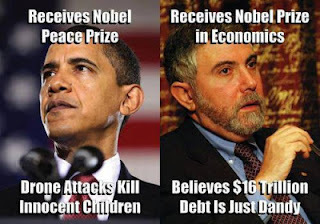 And Obama received his Nobel before he started drone striking children, for his outstanding achievement in having an awesome aura.